This is one of the biggest trends in kitchen countertops today. It is a good look for clean, industrial and contemporary kitchen designs. Available in pre-formed sections or poured and formed on-site. 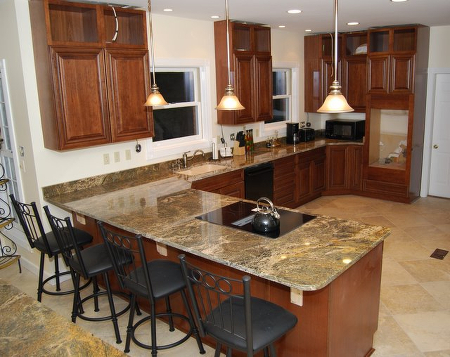 Concrete is an excellent material for unusually shaped counters. Concrete kitchen countertops are expensive, require a sealant and must be treated with care. The countertop can crack if the concrete should contract. Concrete can be stained any color. The most popular color is a natural gray tone. The top layer can be finished as desired. Tile surfaces can be tough, hard-wearing, takes hot pans, heat and stain resistant as well as beautiful. There are many types of tiles including ceramic, porcelain, quarry, glass, natural stone and mosaic. Available in many colors, sizes and textures. It has excellent design flexibility. Tile can often be used for trim or backsplashes. The downside of tile is that the grouts can be easily stained. Also, the tiles can become chipped or cracked. durable material. It is mould, mildew, heat, crack and scratch resistant, impervious to stains, does not need to be sealed and is extremely hygienic. Quartz is available in different looks such as imitation granite and stone or a variety of colours.